These dual power LED String Lights from Cole and Bright come in sets of either 100 or 200 lights. The will normally run through solar power with the included rechargeable battery charging daily through daylight powering it through the solar panel. However when the rechargeable battery has a charge of less than 10% the lights will still work through the included alkaline battery. These means that the string lights should be reliable during both the summer time and during winter. 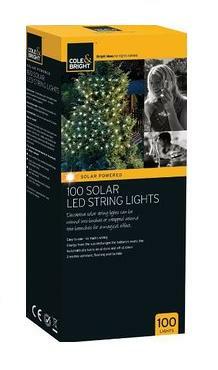 The 100 LED set comes on a 10.9m string. There is a one meter gap between the solar panel and the first LED light and a 10cm gap between each light thereafter. The 200 LED set comes on a 20.9m string and have the same gap proportions as the 100 LED set. 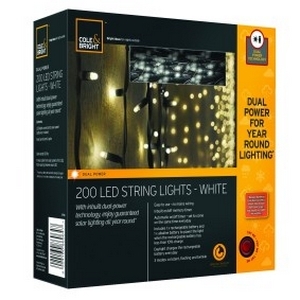 The Cole and Bright Dual LED String Lights can help you reduce your energy bill as no mains wiring is ever required. They automatically switch on at dusk through an in built timer which also automatically switches the lights off after an 8 hour period. The lights have three different mode options constant, flashing and twinkle. The dual power LED lights are ideal when increased night time visibility and security is required and a stunning way to illuminate borders, beds, pathways or to simply create a beautiful mode at garden parties and other outdoor events. What comes in the Dual String Lights Set?